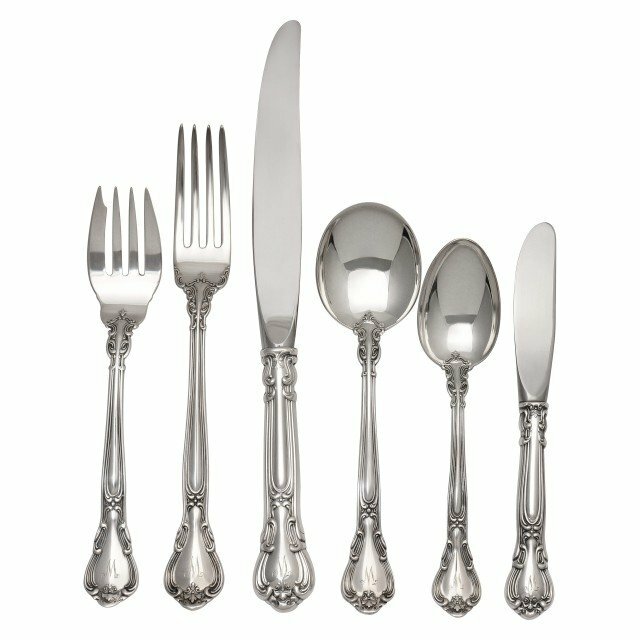 Gorham "Chantilly" Sterling Silver Flatware Set. 9 pc service for 8 - 107 total pcs. Gorham "Chantilly" Sterling Silver Flatware Set 9 pc service for 8 people, incomplete. Contains 107 pcs. 15 place knives 8 1/2"(steel blade),8 butter knives 5 7/8",14 place forks 7",9 salad forks 5 7/8",30 tsps 5 3/4",6 oval soup sps 7",9 cream soup sps 5",5 tablespoons 8 1/2",1 cold meat fk 8",1 master butter kn 6 3/4",1 lemon fk 4 1/4",1 pickle fk 5 3/4",1 fish fk 6 3/8",1 ramekin fk 5 3/8",1 child fk 4 1/2",1 child sp 4 1/2",1 sugar sp w/ gold wash 6 1/8",1 cream ladle 5 1/4" &1 cake/pie server 10" (steel blade). Contains over 85 oz troy w/o silver/stainless knives & servers.